So in addition to hosting Thanksgiving, we planned a surprise vow renewal for my parents in my backyard. I told everyone that I had hired a photographer and they needed to dress accordingly. I even sent them a Pinterest board so it would be a believable lie. 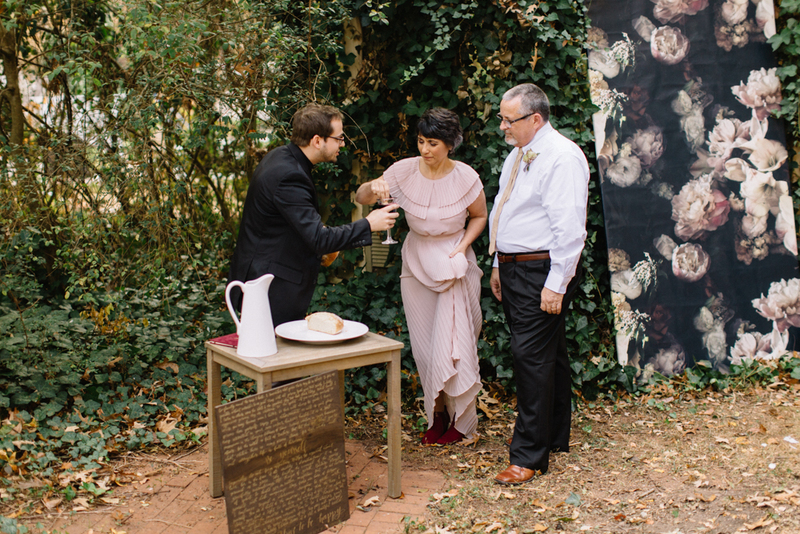 When my parents arrived in the morning, my dad showed my mom my backyard, where the ceremony was setup and let her know that they were renewing their vows that day. She was absolutely speechless and just so excited, she couldn't believe it!! I had dresses for her to choose from, hair and makeup artist on the way, and everything else planned, so all she had to do was get ready for the ceremony! As my family arrived, they were shown to the backyard and filled in on the secret I had been keeping for months! The renewal itself was beautiful, but more than that, their love was so deep and present in that moment. But their story didn't start on that day, it started 34-36 years ago (they both have different answers for how long they've been married). Cheryl and I got married in one day. The way it happened was exactly the way it was supposed to. We had both been sick for more than a week. She was sick first, and I took care of her. Then I caught what she had, and the roles were reversed. It was our first day out of the house in a while. We went to the New York Deli on Troost, in Kansas City. Her roommate remarked how well we took care of each other. She went so far as to say "Ya'll should get married!" Cheryl was sitting in the back seat. So I asked her through the rear view mirror. I was looking in the back seat and said "So you wanna?" And that was it. I didn't even use the word 'married". She looked back at me through the mirror and said "Only if you do it today!" I accepted the challenge, and about four hours later, we were married. The challenges that we had to go through that day were…many. We had to find rings, a priest, a place, a cake, and get a marriage license. We dropped her roommate back at their house. We prioritized, and then started checking the list. Since the license was required, that was the first thing we did. City Hall in Kansas City closed at 4. We got there at 3:50. That was plenty of time for me. I parked the car and we ran up the steps. The guy at the front desk pointed us towards the licensing area. They were clearly closing up as we darted inside. Crossing the room, I looked through the windows. They were facing the area that I parked. It was a no parking zone. So I watched as they towed my truck off. The lady at the desk gave me a frown when I told her we wanted a marriage license. She said those things took time. I told her that we needed to get married while Cheryl's mom (Noni) was in town. I explained to her that Noni was leaving in the morning. I told her that it would be a special gift to Noni if she could make that license happen. Five minutes later we were running down the steps of City Hall, Marriage License in hand. I asked a policeman on the street where it would be. He pointed towards the impound lot, a half block away. On the way there, we passed a pawn shop. We ran inside, picked out some rings, and continued to impound. I paid the bill, and we hit the road again. It would be at Cheryl's house. here was no such things as cell phones, text messaging, or Google. So we headed there to make some calls. I found a priest in the want ads. He told us he would be there by 7. So.. License, rings, and priest were done. Now it was time to call our friends. Including my roommate. When I told him we were getting married, he said "Sure you are." I saw him later that night in Westport. He was out bar hopping. He didn't come to the wedding. I called a couple more people, then turned the phone over to Cheryl. She called her mom and asked her to sit down. She told her she was getting married, and that was that. If you're getting married, you have to get a cake. The only place we could get one was at Baskin Robbins. So I left, while Cheryl stayed to get all gussied up. By the time I got back, the priest and some friends had arrived. He put his robe on, and 10 minutes later we were hitched. We jumped in the car and headed to Westport. We had two weddings that year. One was in Concord, Massachusetts at the oldest church in America. Right behind the church was a bar. My future father in law grabbed me 10 minutes before we were to make our entrance. In those 10 minutes everyone in the bar managed to buy me something called a "Flintlock'. They were in tea glasses, but I drank them like "shots". Speaking of which, I had ordered two Kamikazi's when we walked in. It was Happy Hour, so I got three drinks for every one drink I ordered. Being the fish that I am, I somehow managed to drink them. All of them. Somewhere around 15 drinks in less than 10 minutes. By the time I got back to the Church, I was pretty much snockered. The wedding was full swing, I was laughing…a lot. Everybody remarked on what a happy guy I was. They never knew what had just happened. I had been thinking for some time about a vow renewal. So when Natalie and Tyler called to invite everyone to their new home for Thanksgiving, I mentioned it to her. I knew it would be one of those too rare instances where everyone would be together. I asked if she thought Tyler, and would want to perform the ceremony. She fell in love with the idea, and began putting things together. We decided we wouldn’t tell anyone else about it, including Cheryl. It would be on big, bold, and beautiful surprise. Everyone was told to wear something nice. Natalie told them we would be having photographs taken of the family. So everyone arrived ready for the photographer. Ties, suits, dress pants, shirts, and shoes on all the men. All the ladies were wearing dresses. Natalie had even purchased dresses for Cheryl and Noni. Neither of them knew about it either, until I told them on the porch. Tyler had setup a nice place for the ceremony in their back yard. I took Cheryl out on the porch, pointed at it and said “This is where we are going to have our wedding vow renewal. That’s why all the chairs are out there. It’s going to happen today.” I’m glad she said yes! From that moment until the ceremony started, I didn't see Cheryl. She was taken to a room where she was pampered with a makeup artist, and outfitted with a beautiful dress. It was wonderful. And she made it happen. She got the musician, the dresses, the makeup artist…and of course the minister. She did a fantastic job. It was everything I had imagined and more. I stood there as my beautiful wife came down the aisle, surrounded by our family… and realized how lucky I have been. I can't write much about it at this time, but will be sure to do so in the future! That's their story for now, here are some of the shots from the day! The rest I'm keeping to myself to surprise my parents with very soon!